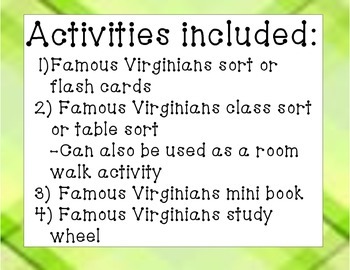 It contains a small sort for the students to keep and play with, the answer key to the sort, a larger sort for classroom and table activities which could include 20 questions and headband games, and a study wheel for the Virginians. The sorts provided endless options for activities in the class. 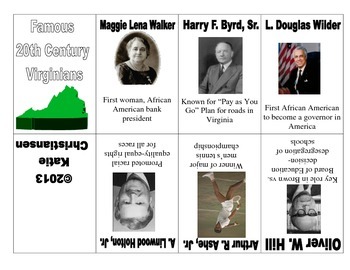 The pictures give the students a way to personalize and recognize the people for a deeper understanding. 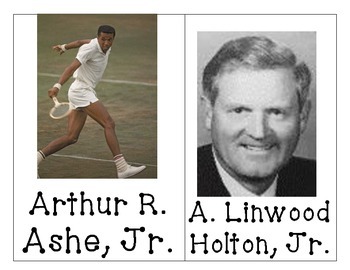 * Arthur R. Ashe, Jr.
* Harry F. Byrd, Sr.
* A. Linwood Holton, Jr.
Each strand of the standard has a notes page (provided grey scale where applicable and an answer key) and at least one accompanying activity. There are foldables, games, cut and paste and more! 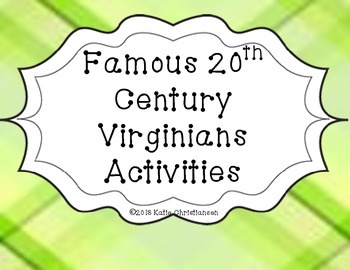 It is also included in my HUGE Growing Virginia Bundle! Become a fan for free for 15 minutes deals and first looks for followers of my store and fans of my Facebook page and TSU page.